For today’s edition of Tattoo Tuesday, artist Jimmy Lazer of Up in Flames Tattoo in Fall River, Mass. gave us this awesome slice of pizza he did on Philip Shive! Philip is a butcher by trade, and used to host a public television show called “Pizza Time” in his hometown in North Carolina. He got the tattoo from Jimmy while on tour playing bass with the David Liebe Hearts Band. For more of Jimmy’s work, check out lazerslaboratory.com! 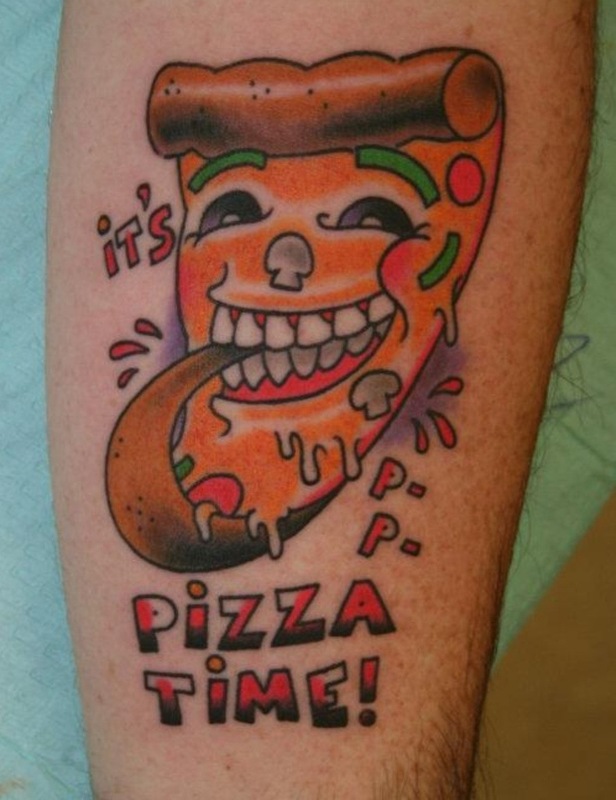 If you’d like us to feature your food tattoo or a piece you’ve done on Tattoo Tuesday, please email your photo, a little backstory, and artist credit to knivesandneedles@gmail.com. Thanks!